In Haslet, most of us give little thought to our septic systems, that is, until there is a serious issue. Keeping on top of your septic system’s maintenance is critical to the longevity of the entire system. Maintenance includes keeping the biological aspect of your tank healthy, inspecting your system regularly and having your tank pumped out and cleaned is a necessity. For proper maintenance your system should be pumped every three to five years depending on the usage of your system. B&B Pumping is proud to serve the people of Haslet, Texas with exceptional septic tank cleaning and pumping. We provide same day services for those times when you have forgotten about having your system cleaned and it becomes a critical issue. If you are in doubt, please give us a call and we can determine if your system needs to be pumped out. There are many different factors that determine how often your tank needs to be pumped. Inside of your tank, there are a whole lot of little microorganisms. These little guys are in charge of digesting the waste that is introduced to the tank. Factors that can increase the frequency of having to clean your system are dependent almost entirely on what you put down your drain. Excessive cleaning products can disrupt the natural balance in your tank and lead to a faster accumulation of waste. Don’t Wait, Call B&B Pumping, Haslet Today! Regardless of whether you have an aerobic or a conventional septic system, we will pump and clean the system. 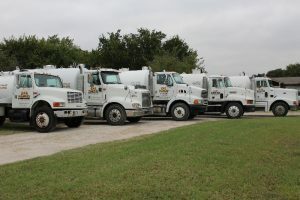 If you live in the Haslet area please give us a call and let us take care of your septic system!